From Brouwerij Liefmans in Oudenaarde, I’m having a bottle of Frambozen Bier. The cork says this raspberry beer was bottled in 2004. 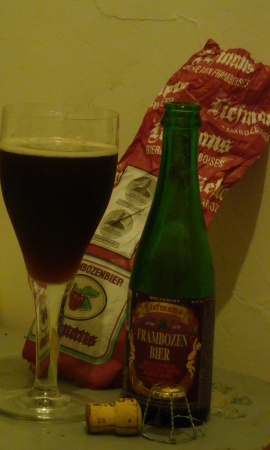 Liefmans Frambozen is not a lambic. It, like other Flanders fruit beers, is made from a sour brown aged on raspberries. The Frambozen Bier pours a hazy ruddy caramel. It has some creamy tan head but that dies relatively quickly. The nose is assertive and strong with raspberries. A bit of cherry and some cotton candy is present as well. If an odor can be syrupy then this one is. A light tart aroma and balsamic vinegar add complexity. The taste is at first a rich tart fruitiness, much like a jam. The raspberries soon give way to a hearty balsamic sour. This fades to a slightly astringent malt character with notes of raspberry as well as kiwi and mango. There is a lingering sweet and sour character with hints of raspberry.